Tom Lie-Nielsen has an enviable reputation as a plane-maker that is founded on the quality of his product. I had heard and read the opinions of many people supporting this, including F&C contributor David Charlesworth, but until recently I had never had the chance to get my hands on one. So, slightly awed by this stunning looking descendant of the Stanley Bedrock, I tried out the No.4 smoothing plane. 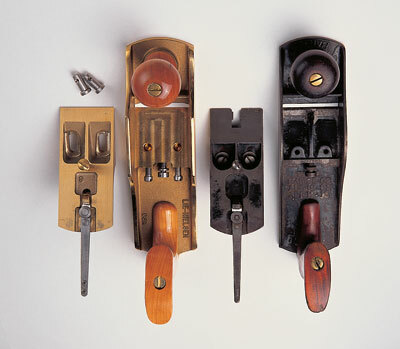 All of the Lie-Nielsen bench planes are based on a Stanley plane known as the Bedrock. Many of the parts are manganese bronze, and, in the case of the No.4, the body is too. This has several advantages - it won't crack if dropped, wears well and doesn't rust. The colour of the bronze gives the plane a wonderful glow, set off by the cherry handles - making it a beautiful looking, as well as an immaculately made tool. 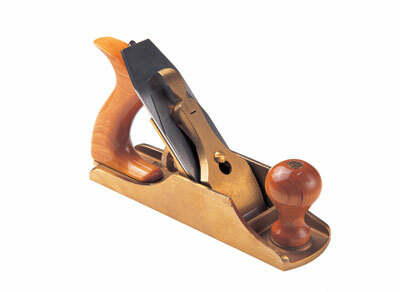 The body of the plane is substantially thicker than other planes of this type and it has a nice weighty feel. The sole is 5mm thick and the sides are a full 4mm. I tested the sole with an American-made Starrett straight edge and found that it was very flat - and I was able to use the plane straight from the box! I checked the sides both with my Starrett combination square and an engineering square. One side was spot on, the other was a fraction out. The blade and chip breaker are of high carbon steel - the chip breaker is a close fit to the blade and the instructions recommend that it should be honed to keep it that way. The lateral adjuster is firm and precise and even that has a small bronze handle on the lever. The fine cut adjuster is cast bronze and a great improvement on the pressed alloy variety usually found. The cap lever is, again, made of bronze. The frog is cast, like the rest of the body, in bronze, and the surface on which the blade sits is precision ground flat. The interior plane sides have two fine ground runners against which the side of the frog body runs when it is adjusted up and down - and there is absolutely no play in this. The bottom face of the frog mates precisely against the polished face of the mouth sole which is ground and polished like the rest. The difference between the Bedrock design and the standard Bailey is in the adjustment mechanism of the frog, see drawing. The threads and fittings of this are crisply made and all work extremely smoothly. The ability to be able to adjust the mouth via the frog with the blade and cap iron in place is what makes this plane a delight to use, together with its weight and feel. The blade is a full 3mm (1/8in) thick and comes sharpened and ready to use. I did give it a tickle on a stone, as I wanted to use it on Indian rosewood - on which it quickly proved itself by achieving a mirror finish. I spent a day in the workshop, planing rosewood, walnut and maple. I tried it out on my shooting board and produced crisp results, easily coping with end-grain. It is an easy to live with companion and a delight to use. It might be expensive but it will last a lifetime! "I wanted to use it on Indian rosewood - on which it quickly proved itself by achieving a mirror finish"